Washington County offers rebates and replacements for qualifying households with old, dirty-burning stoves. Old wood-burning stoves are in the crosshairs of Washington County public health officials as they work to improve the air quality in Oregon's second-most populous county. The county launched its woodstove exchange program back in August 2016 with the goal of removing hundreds of highly polluting stoves from Washington County homes. So far, the program has been going well, officials say. "There's different estimates of how many old, uncertified stoves are in Washington County, but our goal is to change out 700 woodstoves in up to five years," said Tim Davis, who works on the woodstove exchange program in the Washington County Office of Community Development. He added, "We're right on track to do that." Davis and other county officials say that decommissioning old woodstoves is an important step toward reducing air pollution. Woodsmoke is one of the biggest contributors to poor air quality during the winter months in Washington County, according to Kathleen Johnson, senior program coordinator with the Washington County Department of Health and Human Services' Public Health Division. "Air pollution of any kind is not good for human health," Johnson said, explaining further: "The pollution from the woodsmoke is particularly harmful to children in our community, to older adults, and to folks with existing respiratory and heart conditions — in addition to being harmful to everyone." Woodsmoke contains something called fine particulate matter 2.5, or PM2.5. These are, as Johnson described them, "tiny, tiny, tiny particles" — 2.5 micrometers in diameter or smaller, a tiny fraction of the size of a grain of sand — that can work their way into the bloodstream of a person who inhales them. PM2.5 exposure has been linked to a wide range of health complications, including difficulty breathing, heart attacks and ischemic strokes, which can be fatal. Portland had among the worst air quality of any major city in the world for several days last August, as the Willamette Week reported, when smoke from several wildfires burning out of control in Central and Southern Oregon settled over the region. But winter is the season that public health experts say is worst for air pollution. There are two main reasons for that. One is weather-related, as cold air near the ground can lead to the formation of an atmospheric inversion layer that can trap air pollution. The other is simply that when temperatures are cold, heating devices — such as woodstoves — get more use. "Hillsboro and large parts of Washington County sit in this kind of bowl," Johnson said, describing the region's geography. The Coast Range lies to the west, the Chehalem Mountains run across much of the county's southern edge, and the Tualatin Mountains or West Hills rise on the north and east sides of the county. "A lot of that (air) pollution gets trapped." Heating systems can be expensive. The woodstove exchange program helps offset the cost of replacing an old woodstove with a cleaner alternative, such as a pellet- or gas-burning stove, a gas furnace, a heat pump, or simply a newer, more environmentally friendly woodstove. Households qualify for assistance based on income level, with the lowest earners eligible for a full-cost replacement woodstove. The idea behind the rebates is to make getting rid of an old, dirty-burning woodstove a less daunting prospect. "It's an incentive for people who are thinking about it to move on it sooner," Davis said. New this winter, Davis and Forest Grove Light & Power director Keith Horman said Forest Grove residents who participate in the rebate program — $1,500, $2,500 or $3,500 depending on household income, to help pay for the cost of a new heating device — can receive an additional $250 due to a community enhancement grant. Just as most people in Washington County live in its urban areas, Davis said that is where the most woodstoves are, with a particular concentration along the Highway 8 corridor from Forest Grove to Portland. But Davis said the county gets plenty of calls from people who live out in the country, in places like Gales Creek and the North Plains area. "The rural side is changing out more, percentage-wise," Davis said. As for what people end up replacing their old woodstoves with, Davis said it is close to an even split. "Right now, we're at about 45 percent of what we replace are replaced with new woodstoves," he said. "Fifty-five percent are replaced with pellet, gas or electric options." 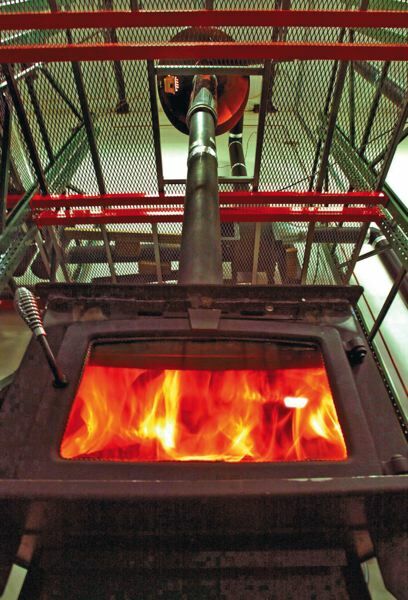 Anyone interested in finding out if they qualify for a rebate or full-cost replacement through the county's woodstove exchange program can learn more on the program's website.